Neuroscience 101: Might Your Teaching and Their Learning Benefit? Might Your Teaching and Their Learning Benefit? This paper’s purpose is to explore the idea that if faculty members acquire significant knowledge of brain basics, much of which has been discovered and/or documented in the past few decades, they can be even better teachers. They can use that knowledge to improve student advising -- show students how to be more effective and efficient -- and, when opportunities arise, enable students to achieve higher levels of creativity and innovation. The presentation begins with a summary of brain features and functions, not at a brain-surgery level of detail, but rather from the perspective of immediate application outside of medicine and inside of engineering education. Building on that foundation, many practical advising and teaching suggestions are offered. The paper then describes whole-brain methods discovered by the author, that is, methods available to assist individuals or teams engage both cranial hemispheres and their conscious and subconscious minds. Suggestions, reinforced with examples/exercises, are offered for ways in which faculty can use the whole-brain tools to help students, especially student teams, be more creative, innovative, and entrepreneurial. Describing the human brain’s features and functions, not at a brain-surgery level of detail, but rather from the perspective of immediate application outside of medicine and inside of engineering education. Suggesting ways in which faculty can use that “Neuroscience 101” knowledge to help students, mostly at the advising level, study smarter – be more effective and efficient. Presenting examples, reinforced with exercises, of whole-brain tools discovered by the author. These methods engage both cranial hemispheres and the conscious and subconscious minds and enable students to be more creative, innovative, and entrepreneurial. Create: Originate, make, or cause to come into existence an entirely new concept, principle, outcome, or object. Innovate: Make something new by purposefully combining different existing principles, ideas, and knowledge. Think of create and innovate as actions that differ by degree of newness, with the former being the ultimate. Many of us are teachers within higher education and/or other settings because, at heart, we are perpetual students and long-ago discovered that a great teacher is first a great student. We entered teaching because we wanted a profession that would enable us to continue to be students. We understand the comment by the French essayist Joseph Joubert that “to teach is to learn twice.” Some of us would, as I have, become intrigued by how neuroscience fundamentals and related thinking/collaboration tools might impact us and our students by enabling both groups to be more effective, efficient, creative, and innovative. My hope is that you have that level of receptivity. This paper wanders outside of engineering and, therefore, definitions of two somewhat common terms – neruroscience and cognitive psychology -- are in order. Neuroscience is “the scientific study the nervous system”2 where the nervous system is the body’s brain, spinal cord, and motor and sensory nerves3. Note that neuroscience was traditionally viewed as a branch of biology. However, it has evolved to an interdisciplinary science connecting with essentially all fields2 which is in keeping with the theme of this paper, that is, looking for explicit connections between brain basics and engineering teaching/learning. The second term, cognitive psychology, is defined as “the scientific study of mind and mental function, including learning, memory, attention, perception, reasoning, language, conceptual development, and decision making”4. It is “the branch of psychology that studies mental processes including how people think, perceive, remember, and learn”5. In summary, and cast in the context of this paper, neuroscience is the study of the brain – the organ -- and its connected nerves. Cognitive psychology is the study of how that brain knowledge helps us understand our thinking, perceiving, remembering, and learning. More specifically, relative to the organization and flow of this paper, the early major section (Brain Features and Functions) is mostly neuroscience and the later two major sections (Apply Brain Basics to Strengthen Student Advising, Use Whole-Brain Methods: Build on Brain Basics to Stimulate Group Efforts) connect with cognitive psychology. My research over the past six years started with searching the neuroscience field to find aspects of it that may help engineers, first as students and later as practitioners, be even more creative and innovative. This led me to a subset of neural features (see the next section of this paper). That knowledge moved me somewhat into cognitive psychology in that I began to seek tools (e.g., whole-brain methods discussed later in this paper) that could build on brain basics to achieve my goal of enhancing engineers’ creativity and innovation. One result, after writing, speaking, and conducting webinars and workshops, was publication of a book6. The preceding unexpectedly turned me to another cognitive psychology topic, mainly, how some aspects of neuroscience could enable teaching and learning. Now, on to neuroscience. This brain primer is a summary of topics drawn from my research including the symmetry and asymmetry of the brain hemispheres, neuroplasticity, conscious and subconscious thinking, the dominance of habits, and negativity bias. While some of these topics may seem alien to teaching and studying engineering, they will be shown later in the paper to have practical value. About the size of a small head of cauliflower, the human brain (Figure 1) weighs two to four pounds or roughly three percent of the body’s weight. It is very soft, tan-gray on the outside, has a surface resembling a walnut, and is yellow white on the inside. The brain contains 100 billion nerve cells, called neurons, which can receive and send electrochemical signals stimulated by neurotransmitters6. 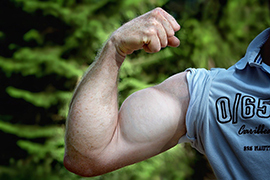 Control body processes such as temperature, blood pressure, heart rate, and breathing. Manage physical motion such as walking, talking, standing, and sitting. Enable us to dream, think, plan, create, and innovate. The first three categories of brain functions occur mostly without us having to think about them. The last category, which we consciously initiate, often leads to amazing advances. When the brain (minus the skull) is viewed from above, as illustrated on Figure 2, we see that it has symmetrical left and right halves or hemispheres. Each of the brain’s hemispheres interacts with the opposite side of the body producing what appears to be a completely symmetrical arrangement8. As you may have concluded from the preceding slightly-qualified text, exceptions to functional symmetry occur. The two sides of the brain tend to be specialized with respect to some of their capabilities and some of the tasks they perform. For example, while the left hemisphere is verbal, logical, temporal, and abstract, the right hemisphere is nonverbal, intuitive, nontemporal, and analogic6. The brain’s asymmetry with respect to these kinds of capabilities has great significance for teaching and learning, especially given the emphasis on left-brain development in K-college education. Up to several decades ago, the human brain was viewed as “a rigid, fixed, and essentially degrading system from birth”9 as suggested by the left image in Figure 3 . Now we know that the brain is neuroplastic. As explained by Norman Doidge, MD,10 “neuro is for neuron…plastic is for changeable, malleable, modifiable.” He goes on to explain that “the damaged brain can often reorganize itself so that when one part fails, another can often substitute.” New connections form between existing neurons and new neurons are formed. Doidge says, as also illustrated in Figure 3, that “the idea that the brain is a muscle that grows with exercise is not a metaphor.” Neuroplasticity offers a variety of opportunities in a teaching-learning-advising environment. Another way, besides left and right brain, to look how parts of our brain function is to consider conscious and subconscious thinking processes. Subconscious refers to brain processes that are below our level of awareness. Other terms for the subconscious are unconscious and preconscious. As an example of using your conscious mind, you define a problem, develop alternative engineering solutions, compare them, select one, and recommend it. You are aware of the cognitive processing required for that effort. With our conscious mind, we are thinking and we know it. In contrast, the cognitive processing in the subconscious mind occurs without our being aware of it. “The [subconscious] mind resides below the surface;” according to psychiatrist Peck11, “it is the possessor of extraordinary knowledge that we aren’t naturally aware of.” In the case of our subconscious mind, we are thinking and we don’t know it. During that conscious engineering process described in the preceding paragraph, we can be certain that the subconscious mind is influencing, unbeknownst to us, parts of the process. Considering further the relative impact on us of our conscious and subconscious minds. Neuroscientist Eagleman12 writes that “consciousness is the smallest player in the operations of our brain. Our brains run mostly on autopilot.” The conscious mind is the tip of the iceberg; the subconscious mind is its bulk. “It is the rule of thumb among cognitive scientists that unconscious thought is 95 percent of all thought,” according to academics Lakoff and Johnson13, who go on to say “and that may be a serious underestimate.” Another major difference: The conscious mind can think of only one topic or thing at a time. In stark contrast, the subconscious mind is a parallel processor7,14. The five whole-brain tools described later in this paper engage or prime our very active subconscious mind. They facilitate interaction between conscious and subconscious thinking while also stimulating left and right-brain thinking. Sometimes the result is very negative, as illustrated by the marketing or relationship developing scenario on the right side of Figure 4. While we recognize the repeated undesirable results, we may not comprehend the habitual process that produces them. The cue-routine-result process, which is essentially controlled by the subconscious mind, is the key to understanding habits and their results. Use of that process to change habits is discussed later in this paper. Figure 4. The subconscious mind experiences a cue, initiates a routine, and generates a result6. Our ancestors lived in a harsh environment, whether on the largely open savanna or the densely-vegetated jungle. These hunter-gatherers frequently faced the threats of predation and starvation. On any given day, they knew they could be “eating lunch” or “be lunch.” They learned to be very cautious when considering short-term actions and their possible consequences, to frequently see danger or potential danger in a variety of common daily circumstances, and to act defensively. They had a negativity bias18. A variation on negativity bias is the anger superiority effect8 which means that we are more likely to see an angry face in a crowd or audience when we are about to speak than a friendly, approving face. 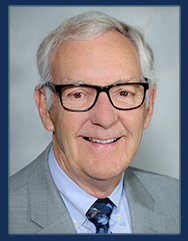 Gene C. Cohen, MD19says “this basic brain imbalance between our reason and our emotions leads to all sorts of trouble” and, we might add, missed opportunities as discussed later in this paper. 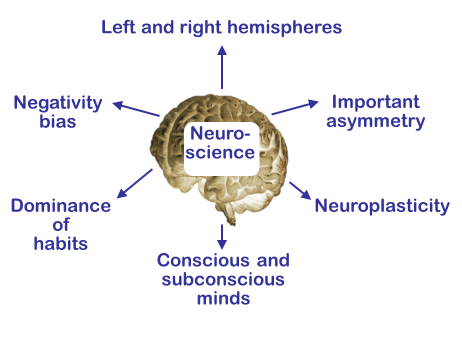 Figure 5 summarizes the just-discussed features and functions of the human brain. Building on that brain primer foundation, consider ways in which you can help students, mostly at the personal level, enhance their performance by studying smarter -- by being more effective and efficient. Figure 5. These features and functions of the human brain are relevant to working smarter and enhancing creativity and innovation6. The six suggestions that follow (multitasking, struggling students, habits, einstellung, negativity bias, and vision) are very suitable for one-on-one discussions with your students. Share “Neuroscience 101” knowledge with them and show how it can make them more effective and efficient and perhaps more creative, innovative, and entrepreneurial. As noted in the conscious-subconscious discussion, the conscious mind can think of only one topic at a time. Therefore, multitasking, which is really jumping or toggling from thinking task to thinking task, is very inefficient because of the time, perhaps unnoticed, needed to resume a task. Brain researcher Medina7 describes the “50-50” negative consequences of multi-tasking by stating “studies show that a person who is interrupted takes 50 percent longer to accomplish a task …and he or she makes up to 50 percent more errors.” Research conducted by psychologists Strayer and Watson20 concluded that “our performance [on any given task] deteriorates drastically when we attempt to focus on more than one task at a time.” Multitasking also increases stress (e.g., see Bregman21). Encourage students to minimize multitasking so that they make better use of their time, make fewer errors, reduce stress, and think with greater clarity. Urge them to study time management principles and procedures. Consider one of the implications of neuroplasticity. Author and biology professor Zull titled his book The Art of Changing the Brain22 because he defines teaching and learning as the teacher and the student working together to physically change the student’s brain. Zull reinforces the physical change idea by referring to the “biology of learning” as a way of encouraging teachers to study the human brain. Educator Hardiman takes a similar tact in her book Connecting Brain Research with Effective Teaching: The Brain-Targeted Teaching Model23. She urges educators to “become better consumers of the mountains of research that have emerged since the 1990s.” For example, she highlights the important role the physical environment plays in teaching and learning. Suggestion: Encourage students to inventory their habits, to look at relevant portions of their daily routines. Are their habits aligned with what they want to achieve? If not, urge them to, in prioritized fashion, begin to change habits through the process of repetitive cue-routine-result cycles. Assume a student has the bad habit of putting off doing your homework until late at night and wants to replace that habit with doing it earlier and better. Consider what happens now: He/she comes back to the dormitory room after the last class and the cue is the television. The routine is to turn it on, and the result is to relax and catch up on things. This leads to the next cue, which is hunger and the routine is to go out for a quick meal and the result is feeling good. Late that night, he/she finally gets to work on some homework and it is probably that which is due tomorrow. The work is difficult, given the late hour, and the quality reflects neither the student’s ability nor desire. Therefore, you advise the student to use the method shown in Figure 6 to replace his/her bad homework habit with a good one. to replace a “bad” habit with a “good” habit6. You suggest, that starting today, when he/she comes back to the dormitory room after the last class, the cue is still the television. However, the new routine is to not turn it on and to instead do one homework assignment that is due the next day of class, no matter when that day is. Having done that, on this first day of his/her new “habit,” the result is to relax knowing that the homework is done in a manner that reflects the student’s ability and to be able to now watch television and catch up on things. That one-time change may have been easy provided he/she knew, recognized, and acted on the cue. However, the student is very far from replacing the bad habit with a new habit. He/she must persist. 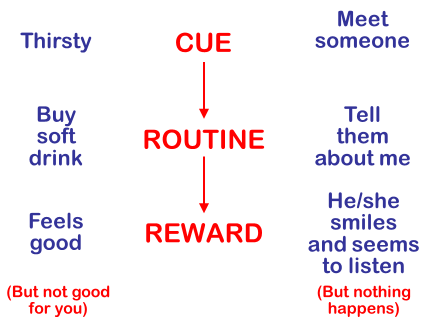 Next time the student experiences the cue, he/she repeats the new routine, or refines it, and follows through. Eventually, the student’s subconscious learns the new habit. The pay-off is reduced stress and improved academic performance. 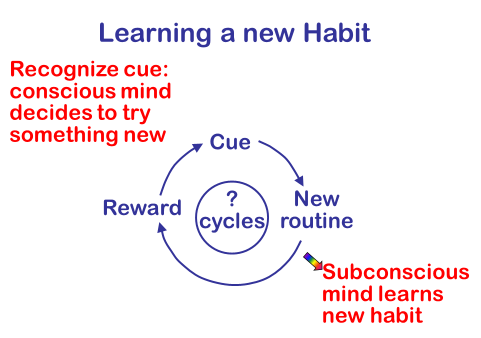 A very natural question is: How many cue-routine-result cycles are needed for a specific person’s subconscious mind to acquire a new habit. One study25 concluded that nine weeks to several months were needed for habit formation whereas Connellan26 suggests 21 to 30 days. These and other widely varying results, combined with my habit formation experience, suggest that the necessary number of cycles is highly variable and each student will have to assess their own situation. The preceding habit change discussion nicely segues into discussion of the Einstellung Effect which, when operable, inhibits creativity and innovation. The German word einstellung has meanings such as approach, mind set, or attitude. The Einstellung Effect means trying to resolve a challenge only by using approaches, mind sets, or attitudes that have worked in similar situations, rather than looking at each new situation on its own terms27. This dogged tendency “sometimes blinds people to more efficient or appropriate solutions than the ones they already know”28. Another term for this creativity-innovation barrier is design fixation which may be defined as an “unintentional adherence to set of ideas or concepts limiting the output of the conceptual design”29. The ominous word in that sentence is “unintentional” because it reminds us that we may unknowingly or habitually rule out a fresh perspective. We may welcome a new challenge and be committed to resolving it, but be unwittingly locked into the past. Call it what you want, but this predisposition to familiarity may prevent consideration of creative-innovative approaches. Recollection: “…past experience is reviewed and solutions to similar problems in the past are identified.” This is the left brain at work and the die is cast. This traditional, time-proven engineering approach is sound. It has resulted in untold numbers of successful engineered structures, facilities, systems, products, and processes. So why the concern -- why question it -- why “mess” with success? Informed by McCuen’s crisp four-step description of the standard operating procedure, I am most concerned with Step 2, that is, only focusing on similar past problems and, more importantly, their solutions. Shouldn’t we and our students try to do more than rehash old solutions -- as successful as they may have been? Might we and they find great value in also exploring fundamentally new approaches? How can we resist the Einstellung Effect? The first part of the answer to the last question is to be aware of the effect. We can’t “fix” something if we don’t know it exists. Urge students to couple being aware of the Einstellung Effect with application of the whole-brain methods presented later in this paper. Suggest that they consider the tried-and-true approach to a given technical or nontechnical challenge while paralleling it with a fresh perspective, with a whole-brain approach. The French philosopher Henri Bergson in effect warned us about the Einstellung Effect trap when he said that our eyes see only what our mind is inclined to comprehend. We and our students should prepare our minds to comprehend more than what we have done in the past. Otherwise, we habitually fall into only considering variations on what has worked in the past. We are stung by Einstellung. Asked to speak about his co-op experience at the next meeting of the student chapter of a professional society, he declines because of an earlier speaking disaster. On receiving an offer from a professor to work on an especially challenging independent study, she defers because of an unfortunate project failure during her sophomore year. Explain to your students that the brain is “like Velcro for bad experiences but Teflon for good ones”18. It will automatically cause the student to recall some negative event or circumstance that is counter to pursuing the offered opportunity. Urge the student to recall one or more of his or her goals that might be advanced by this opportunity. Then, and only then, decide. Consider the dominance of vision from the perspective of a presenter, such as students trying to convey ideas and information to an audience. Unfortunately, too many presentation slides consist of a statement followed by bullet points. Research reveals that the most effective slide contains a declarative statement with a supporting image. Audience members tend to learn and remember better from coordinated words and pictures rather than from words alone7,31. When students are trying to understand or explain a process or mechanism, urge them to make one or more freehand sketches. The next time they prepare a presentation, get them beyond communicating with just or mostly words. Encourage them to use many and varied visuals such as photographs, props, graphs, line drawings, and other visual elements. Also help them understand that while the audience will listen to their words and look at their visual aids, their expressions, gestures, grooming, and overall appearance are part of the message. Why? Because vision rules. The hand writer is much less likely to divert to one or more internet distractions. When faced with a well-defined technical or nontechnical issue, problem, or opportunity (IPO), we typically begin by developing a list of ideas or options for defining the IPO and, later, for resolving it. This is divergent thinking, as illustrated in the upper part of Figure 7. 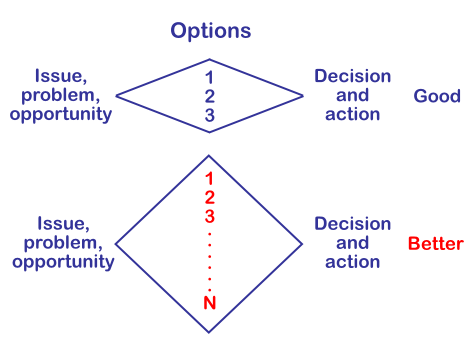 Then we explore the pros and cons of each idea or option, make a decision, and act on it. This is convergent thinking, as also shown in the upper part of Figure 7. Figure 7. The divergent-convergent thinking process can generate even more ideas or options to define and then resolve a challenge when it is enhanced using whole-brain tools6. Fortunately, many methods are available to assist your students, working alone or preferably in collaboration with others, to engage both cranial hemispheres and conscious and subconscious minds and make use of other brain basics described earlier in this paper. The commonality of the items in this cognitive toolkit is being able to stimulate individuals and groups to think more deeply and widely. Your group’s goal is to generate more ideas, analyze them, explore many and varied optional courses of action, select among them, and implement the best choice. Back to the divergent-convergent thinking process. To reiterate, the early-on-more-is-better concept applies whether students are striving to define an IPO or endeavoring to resolve one. For example, some of the whole-brain tools described in this section (e.g., Medici Effect, Fishbone Diagramming, Mind Mapping) will enable students or their teams to generate many more ideas about possible causes of a problem in the divergent portion of the divergent-convergent process and then zero in on the most likely cause in the convergent portion. Similarly, some tools (e.g., Mind Mapping, Biomimicry, What If?) will help students generate options for resolving the IPO within the divergent portion of the divergent-convergent process and then select the best solution in the convergent portion. Urge students to separate their group’s divergent thinking from convergent thinking, whether they are attempting to define or resolve an IPO, so that they maximize idea generation. Do the divergent part thoroughly before even thinking about the convergent part. Don’t mix the two cognitive processes and don’t rush through either of them lest they fail to do either one well. Furthermore, consistent with what we learned about the subconscious mind earlier in this paper, try to do both divergent and convergent thinking intermittently to engage in and benefit from the 24/7 subconscious thinking of all participants. The practical considerations of paper writing meant that while I searched far and wide for whole-brain methods, I needed to select a workable subset for this paper. The five representative methods described here are part of the 20 methods included in my book2 which are, in turn, a subset of the universe of tools. One way of describing the Medici Effect is gathering a whole-brain team; a team composed of individuals with highly varied cognitive capabilities, personality profiles, and other characteristics. As someone said, “none of us is as smart as all of us.” Engineering professor Sutton characterizes the Medici Effect as bringing together “people who know too much and people who know too little”32. In advocating the practice of assembling and then energizing a truly diverse group, we are in effect using a mini-version of the Medici Effect which formed the foundation for the Renaissance. As explained by consultant Johansson33, in the 15th Century the wealthy Medici banking family of Florence, Italy, became strong supporters of the arts and sciences. More specifically, the Medicis and a few others brought to Florence and generously supported “sculptors, scientists, poets, philosophers, financiers, painters, and architects” which led to “a remarkable burst of creativity.” Your students can use the six-century old Medici Effect to establish a Renaissance-type atmosphere in their groups, an atmosphere of diverse ideas generated by the interactions of a diverse set of perspectives. Share the Enigma story with your students to illustrate the value of the Medici Effect. During World War II, the German navy quickly assembled groups of submarines, called “wolf packs,” to attack and sink allied ships. Any German submarine that observed an allied ship or a convoy of them would use a coded message to call in other submarines and then the “wolf pack” would converge and destroy the ship. They were effective in that for a year or two, the Germans sank an average of 50 ships per month with total casualties of over 50,00033. The allies had to break the code, called Enigma, so that they could warn and protect their ships and take other military offensive and defensive actions. Accordingly, the British intelligence unit gathered, in Medici Effect style, a diverse group of potential code breakers who worked in a Victorian mansion northeast of London. The group included linguists, mathematicians, chess grand masters, scientists, crossword puzzle experts, and individuals from many countries all committed, for various reasons, to break Enigma. Their achievement was described as the greatest intelligence triumph of World War II or any war because the allies could now read Germany’s highly-secret messages33,34. Individually, none of the participants would have been successful, but collectively, their diverse personal profiles enabled them to solve Enigma. Neuroscience basis: The Medici Effect can build on your students’ expanding neuroscience knowledge. It recognizes that, while our brains may look similar, each of us has a unique knowledge-skills-attitudes set and personality profile that, among other implications, means each student can make one-of-a-kind contributions to any team’s creative-innovative effort. See Appendix A for Exercise 1 (personality profile), which could be used to provide students with added understanding of themselves, others, and the Medici Effect. Advice based on experience: Because you are likely to form student teams, or ask them to do so, in some of your courses, I urge you to experiment with the Medici Effect. However, my experience suggests that Medici-based heterogeneous teams will have a more difficult time getting started than more typical homogeneous teams but will be much more productive if the goal is creative/innovative results35. If you or your students form teams based on Medici Effect principles and then struggle, urge them to recognize, work through, and benefit from the likely forming-storming-norming-performing and, sometimes, mourning process6. Fishbone Diagramming, which is also called cause-and-effect diagramming or Ishikawa Analysis36,37, provides a systematic means for identifying widely-varying possible causes of a problem. It is a diagnostic tool that can be used by individual students or by student teams to enhance the breadth and depth of their search for possible causes of or motivations for a challenge facing them. The strongest argument for using Fishbone Diagramming is this principle: A challenge well-defined is half resolved. Let’s explain the Fishbone Diagramming process with an example that is based on one of my consulting experiences. Assume that you and your very diverse team (e.g., engineers, technologists, technicians, maintenance personnel, and construction personnel) are studying a recently constructed stormwater retention facility that seemed to have failed to protect downstream properties during a large rainfall event. A stormwater retention facility is typically designed and constructed to serve multiple purposes in an urban area. It normally contains some water for aesthetic and recreation purposes. However, its configuration and outlet works allow the facility to temporarily store additional water – stormwater runoff – for later slow release so that downstream properties are not flooded during major rainfall events. Figure 8. 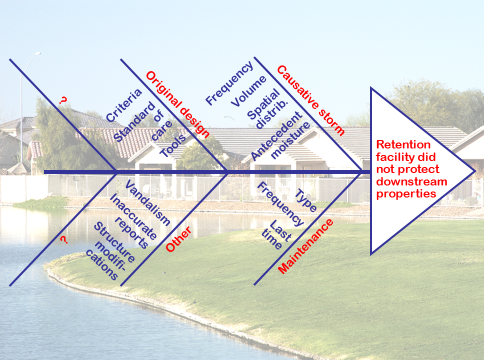 Fishbone Diagramming provides a systematic means for identifying widely-varying possible causes of a problem such as suspected failure of a stormwater retention facility6. Next, collaboratively identify “bones” as shown in Figure 8, by defining categories of possible causes of “failure” such as the causative storm, maintenance, the original design, and others. Detail each bone and make judgments as to the likely cause or causes of failure and develop an action plan to further investigate the most likely causes. The process of having an individual or team carefully identify each “bone” and then detail each one encourages breadth and depth of up-front thinking and reduces the likelihood of jumping to incorrect conclusions. Neuroscience basis: Fishbone Diagramming is effective because its highly visual nature stimulates right-hemisphere processing to supplement that of the left hemisphere. The process is open-ended and stimulates whole-brain thinking because the evolving fishbone can have an unlimited number of bones and each bone can have an unlimited number of features. If this method is conducted as a series of events, on-going stimulation of the subconscious mind will result in additional “bones” and/or elements of “bones.” Exercise 2 (bridge failure) in Appendix A gives students an opportunity to apply Fishbone Diagramming. Advice based on experience: If you experiment with Fishbone Diagramming, stress the idea that a challenge (issue, problem, opportunity) that is well-defined is half solved. While a team may not be asked, at least initially, to resolve a challenge, team members will begin to see solutions but they should defer that discussion. Consider a follow up exercise during which the group would take on the now-defined challenge perhaps using one of the three whole-brain methods described next. Mind Mapping38,39 which is also known as clustering40, is a highly-visual method that helps an individual or team address an IPO. It is effective in defining a challenge and then, by applying Mind Mapping again, in identifying potential ways to resolve it. As a means of describing the Mind Mapping process, consider Figure 9, a mind map developed by a group of four6. They were addressing a problematic pond in a residential area. A 25-minute Mind Mapping session was used to define the problem. For the purpose of sharing the result, the subject of the mind map is not important other than to say that, at the outset, the topic being addressed was poorly defined in that the four individuals had different perceptions of the problem. The important aspects are the resulting format and the process used to create it. Figure 9. Preparing this mind map enabled a group to quickly define a problem6. To get started, suggest that students state and show, in a manner visible to everyone such as on a white board or newsprint, the topic which, as indicated in Figure 9, was “Pond problem” Then ask each participant, “what does this make us think of?” or “what comes to mind?” Whatever “pops” into any student’s mind, and is shared, is added to the mind map using ovals and connecting them with arrows. This tool “radiates visual and spatial cues from a central idea”41. Anything goes; if a student thinks their idea is connected in some way to what is already shown on the mind map, then it is. Urge the students not to judge any of the suggestions other than to ask for clarification. One or more participants may want to go into an analysis mode. The facilitator must nip this in the bud. My experience in using Mind Mapping is that once a group gets started, they will quickly generate a flood of ideas. And very soon, a large mind map or cluster appears. To reiterate, while doing this, do not be judgmental of anything or anyone. If something is suggested, it gets mapped. 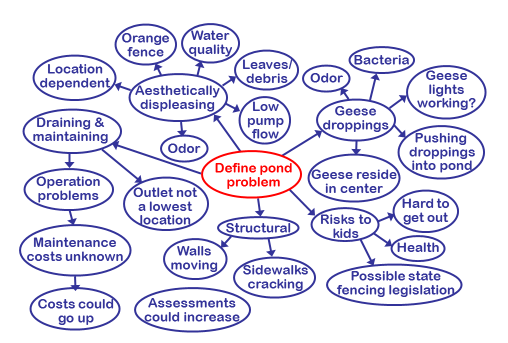 As shown in Figure 9, Mind Mapping identified five problem areas (aesthetics, geese, safety, structural, and draining/maintaining) and elaborated on each of them. As soon as the mind map was finished, the group turned to a discussion of possible solutions, one of which was implemented. The essence of this Mind Mapping example is that a problem well-defined is half solved and group Mind Mapping is an excellent problem-definition tool. As a consultant to a city utility studying whether or not to continue fluoridation of the public water supply, I facilitated two Mind Mapping exercises to help their Fluoride Commission imagine the many and varied possible consequences of whatever they decided to do. One session assumed that they would recommend terminating fluoridation and the other session assumed they would continue fluoridation. Using this tool, both sessions quickly generated many ideas that proved useful in making their final recommendation which was to continue fluoridation and revisit the issue in five years42. I worked with a team of graduate students who used Mind Mapping to identify 14 potential uses, in addition to safety, for highway median barriers. Another student team used Mind Mapping to list many and varied structural and non-structural ways to quickly and temporarily flood-proof a highly-vulnerable manufacturing plant that was threatened with flooding because of melting of unusually heavy watershed snow cover43. Former professor Tomasz Arciszewski44 prepared a mind map showing ways to create the ambience needed for a successful engineering department at a university. Neuroscience basis: Mind Mapping reflects neuroscience partly because when this method is applied, the subconscious minds of participants are directed by their conscious minds, become engaged, and begin to contribute ideas and information, especially if a follow-up session occurs. Furthermore, this method’s strong visual feature in the form of an expanding, highly visible cluster of ovals or other shapes, stimulates activity in both hemispheres of participants. See Appendix A for Exercise 3 (median barriers), which engages students in Mind Mapping. Advice based on experience: I’ve observed student and practitioner groups take on a challenge like Exercise 3 with Mind Mapping, while other groups apply traditional brainstorming. You might have some student teams do Exercise 3 with Mind Mapping while others apply brainstorming. See if, over a period of time, one method proves more effective than the other. I believe Mind Mapping will “win” in the long run because it adds a strong visual element to traditional brainstorming. Artificial floating wetlands designed to remove potential pollutants from ponds and lakes were inspired by natural floating peat bogs46. Seashell shapes inspired the design of the Sydney Opera House47. Peristaltic pumps mimic the valves and chambers in animal and human hearts47. Nature’s honeycomb objects, such as the hexagonal cellular structure within beehives, inspired the design of aircraft structural elements because of the need for high strength-to-weight ratios47. 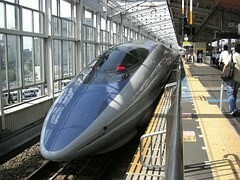 Share Biomimicry stories with them such as the one about Japan’s high-speed trains. They are known for their safety, efficiency, and comfort. However, until the late 1990s, some lines were criticized for the loud noise they made on exiting the country’s many tunnels. “When a train entered a tunnel, its bullet-shaped nose compressed the air into something like a tidal wave; when the wave exited the tunnel, it expanded so rapidly it set off what is known as a tunnel boom”48. 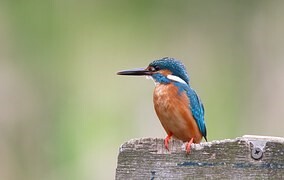 Consider the long tapering beak of the Kingfisher (Figure 10), a bird that dives quickly and quietly into water to catch fish. The bird and its beak were known to Eiji Nakatsu, Chief Engineer of the West Japan Railway Corporation, because he was a birder. His engineers experimented by firing various shaped bullets through a pipe until they found the shape that caused the least tunnel boom. The new Kingfisher beak-shaped trains (Figure 11) went into service in 199748,49. Neuroscience basis: Assume that students are faced with a challenge and begin to consciously see and comprehend, not just look at, the natural world in an attempt to resolve the challenge. They are committed to finding, within nature, some potential solutions. With focus, the students get some initial ideas. Given their intensity, their subconscious minds are very likely to go to work on the project and provide more Biomimicry ideas. See Exercise 4 (high diving) in Appendix A which offers students a Biomimicry experience. Additionally, contemplating nature is likely to elicit an emotional response which more fully engages the right brain. 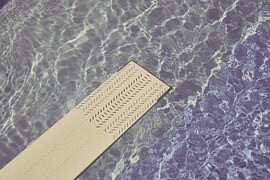 Advice based on experience: One approach to the high-diving challenge is to aerate that portion of the pool’s impact zone50. If the students applied Biomimicry they may be led, as they think about nature, to the pool at the base of a waterfall and then think of aeration. When students are faced with a challenging IPO, urge them to ask “What If?” in a way that temporarily and radically changes their point of view51,52. In order to fully engage both of their brain’s hemispheres, suggest that they metaphorically take a bird’s eye view -- look at the challenge from just above, a worm’s eye view -- look at the challenge from below, or 30,000-foot view -- look at it from way above to see the bigger picture -- the wider context. Using What If? thinking, the 8.6 square mile community of Skokie, Illinois very cost-effectively solved a widespread combined sewer basement flooding problem by developing a system that intentionally and temporarily stored stormwater on streets and then released it slowly into the combined sewers53. Using What If? thinking, engineer John Stevens enabled the successful completion of the Panama Canal by viewing the project as a railroad project which was his way of focusing not on excavation but on efficiently hauling away excavated rock and earth54. Using What If? thinking, a Netherland’s city with an out-of-control refuse problem developed a system that sensed when refuse was added to a trash container and then activated an audio system that played a joke with the jokes being frequently changed55. Neuroscience basis: The What If? method moves students away from over reliance on left-brain thinking toward engaging their right brains because it temporarily sets aside typical logical constraints provided by the left hemisphere. Therefore, at least temporarily, individuals or members of a team are more likely to think in a whole-brained manner. Finally, the often unusual ideas generated by What If? stimulate the subconscious mind to ponder the implications. Exercise 5 (disaster waste) in Appendix A will give students an opportunity to apply What If? Advice based on experience: A small group of practitioners worked on Exercise 5 for about 10 minutes. They developed these What If? responses: A huge sink hole opened up, the material could be sorted and then recycled, if near an ocean it could be barged away, burned for energy, everybody has to take some, rail it out, use to build something else, and sold for souvenirs. When done correctly, What If? typically produces some zany results some of which, on further reflection, motivate more realistic ideas. For example, consider the preceding “use to build something” result. This might lead the group to consider using some of the materials to construct a sledding hill at a local park. Balance cognition and emotion to stimulate learning, which is another way of saying that teachers should find ways to engage both of the brain’s hemispheres. One way to do this, besides the whole-brain methods described in the paper, is to use story telling because stories are about life and life is about cognition and emotion56. Encourage physical exercise which enhances learning because it increases the number of blood vessels in the brain and the supply of oxygen, glucose, and other nutrients; stimulates more neuron connections; and increases the number of neurons6, 56. This paper’s purpose is to explore the idea that if faculty members acquire significant knowledge of some of the brain basics discovered and/or documented in the past few decades, they can be even better teachers. Describing human brain features and functions in sufficient detail to establish the necessary neuroscience knowledge foundation. Topics discussed are hemisphere symmetry and asymmetry, neuroplasticity, conscious and subconscious thinking, habits, Einstellung Effect, and negativity bias. Suggesting ways faculty, in an advising mode, can build on “Neuroscience 101” knowledge to help students study smarter. Examples used are reducing multitasking, appreciating neuroplasticity, changing habits, minimizing the Einstellung Effect, offsetting negativity bias, leveraging vision, and improving note taking. Describing and illustrating with examples five representative whole-brain tools intended to stimulate individuals and groups to work smarter, that is, be more effective, efficient, creative, innovative, and entrepreneurial. The methods described are: Medici Effect, Fishbone Diagramming, Mind Mapping, Biomimicry, and What If? I hope that you, and other engineering faculty, will find the ideas and information in this paper useful in your continued studies and your teaching and advising work. I welcome conversations with you. 1. Cooper, R. K. 2006. Get Out of Your Own Way: The 5 Keys to Surpassing Everyone’s Expectations, Crown Business, New York, NY. 2. Wikipedia. 2016a. “Neuroscience,” (https://en.wikipedia.org/wiki/Neuroscience), accessed March 9, 2016. 3. Wikipedia. 2016b. “Nervous System,” (https://en.wikipedia.org/wiki/Nervous_system), accessed March 9, 2016. 4. Rutgers –Department of Psychology. 2016. ( http://psych.rutgers.edu/co), accessed March 9, 2016. 5. About Health. 2016 (http://psychology.about.com/od/cognitivepsychology/f/cogpsych.htm), accessed March 9, 2016. 6. Walesh, S. G. 2016. Introduction to Creativity and Innovation for Engineers, Pearson Education, Hoboken, NJ. 7. Medina, J. 2008. Brain Rules: 12 Principles for Surviving and Thriving at Work, Home, and School, Pear Press, Seattle, WA. 8. Restak, R. and S. Kim. 2010. The Playful Brain: The Surprising Science of How Puzzles Improve Your Mind, Riverhead Books, New York, NY. 9. Nussbaum, P. D. 2010. Save Your Brain: Five Things You Must Do to Keep Your Mind Young and Sharp, McGraw-Hill, New York, NY. 10. Doidge, N. 2007. The Brain That Changes Itself: Stories of Personal Triumph from the Frontiers of Brain Science, Penguin Books, New York, NY. 11. Peck, M. S. 1997. The Road Less Traveled and Beyond: Spiritual Growth in an Age of Anxiety, Simon & Schuster, New York, NY. 12. Eagleman, D. 2012. Incognito: The Secret Lives of the Brain, Vintage Books, New York, NY. 13. Lakoff, G. and M. Johnson. 1999. Philosophy in the Flesh: The Embodied Mind and Its Challenge to Western Thought, Basic Books, New York, NY. 14. Taylor, J. B. 2009. My Stroke of Insight: A Brain Scientist’s Personal Journey, Penguin Group, New York, NY. 15. Duhigg, C. 2012. The Power of Habit: Why We Do What We Do in Life and Business, Random House, New York, NY. 16. Neal, D. T., W. Wood, and J. M. Quinn. 2006. “Habits – A Repeat Performance,” Current Directions in Psychological Science, Association for Psychological Science, Vol. 15, No. 4, pp. 198-202. 17. Verplanken, B. and W. Wood. 2006. “Interventions to Break and Create Consumer Habits,” Journal of Public Policy and Marketing, American Marketing Association, Spring, pp. 90-103. 18. Hanson, R. 2013. Hardwiring Happiness: The New Brain Science of Contentment, Calm, and Confidence, Harmony Books, New York, NY. 19. Cohen, G. C. 2005. The Mature Mind: The Positive Power of the Aging Brain, Basic Books, New York, NY. 20. Strayer, D. L. and J. M. Watson. 2012. “Supertaskers and the Multitasking Brain,” Scientific American Mind, March/April, pp. 22-29. 21. Bregman, P. 2011. “How (and Why) to Stop Multitasking,” Harvard Business Review, December 4. 22. Zull, J. E. 2002. The Art of Changing the Brain: Enriching the Practice of Teaching by Exploring the Biology of Learning, Stylus Publishing, Sterling, VA.
23. Hardiman, M. M. 2003. Connecting Brain Research with Effective Teaching: The Brain-Targeted Teaching Model, Rowman & Littlefield Education, Lanham, MD. 24. Mandino, O. 1968. The Greatest Salesman in the World, Bantam Books, New York, NY. 25. Jabr, F. 2011. “How to Form a Habit,” Scientific American Mind, January/February, p. 7. 26. Connellan, T. 2011. The 1% Solution for Work and Life, Peak Performance Press, Chelsea, MI. 27. Brooks, D. 2011. “Tools for Thinking,” The New York Times, April 1. 28. Bilalic, M. and P. McLeod. 2014. “Why Good Thoughts Block Better Ones,” Scientific American, March, pp. 72-79. 29. Genco, N., K. Holtta-Otto, and C. C. Seepersad. 2012. “An Experimental Investigation of the Innovative Capabilities of Undergraduate Engineering Students,” Journal of Engineering Education – ASEE, January, pp. 60-81. 30. McCuen, R. H. 2012. “Creativity: An Important Problem-Solving Tool for Water Resources in 2050,” Chapter 33, in Toward a Sustainable Water Future: Visions for 2050, American Society of Civil Engineers, Reston, VA.
31. Atkinson, C. 2010. Beyond Bullet Points: Using Microsoft PowerPoint 2007 to Create Presentations That Inform, Motivate, and Inspire, Microsoft Press, Redmond, WA. 32. Wolff, J. 2012. Creativity Now, Pearson, Harlow, England. 33. Johansson, F. 2006. The Medici Effect, Harvard Business School Press, Cambridge, MA. 34. Macintyre, B. 2012. Double Cross: The True Story of the D-Day Spies, Crown Publishers, New York, NY. 35. Herrmann, N. 1996. The Whole Brain Business Book: Unlocking the Power of Whole Brain Thinking in Individuals and Organizations, McGraw-Hill, New York, NY. 36. Dhillon, B. S. 2006. Creativity for Engineers, World Scientific, Hackensack, NJ. 37. Hensey, M. 1993. “Essential Tools for Total Quality Management,” Journal of Management in Engineering – ASCE, October, pp. 329-339. 38.Arciszewski, T. 2009. Successful Education: How to Educate Creative Engineers, Successful Education LLC, Fairfax, VA.
39. Gross, R. 1991. Peak Learning, Jeremy P. Tarcher, Los Angeles, CA. 40. Rico, G. 2000. Writing the Natural Way: Using Right-Brain Techniques to Release Your Expressive Powers, Jeremy P. Tarcher/Putnam, New York, NY. 41. Miles, E. 1997. Tune Your Brain: Using Music to Manage Your Mind, Body, and Mood, Berkley Books, New York, NY. 42. Fluoride Commission. 2014. Report from the Fluoride Commission to the Valparaiso City Utilities Board of Directors, Valparaiso, IN, August 21. 43. Walesh, S. G. 2011. “Project Management and Creativity/Innovation,” Portion of the graduate course Master of Leadership in Engineering, Civil Engineering School, Castilla LaMancha University, Ciudad Real, Spain, September 19-22. 44. Arciszewski, T. 2009. Successful Education: How to Educate Creative Engineers, Successful Education LLC, Fairfax, VA.
45. Benyus, J. M .1997. Biomimicry: Innovation Inspired by Nature, Harper Perennial, New York, NY. 46. Klatt, B. 2011. “Bruce ‘75: Floating a Sustainable Idea,” On Wisconsin Magazine, (http://onwisconsin.uwalumni.com/departments/bruce-kania-75-floating-a-sustainable-idea/), Fall, accessed November 18, 2014. 47. Bar-Cohen, Y. (Editor), 2012. Biomimetics: Nature-Based Innovation, Chapter 1- “Introduction: Nature as a Source for Inspiration and Innovation,” CRC Press, Boca Raton, FL. 48. Vanderbilt, T. 2012. “Better Living Through Imitation: Biomimicry Engineers are Finding the Designs of the Future in the Greatest Field Laboratory of the Past – The Natural World,” Smithsonian, September 2012, pp. 50-53. 49. EarthSky 2012. “Sunni Robertson on How a Kingfisher Inspired a Bullet Train,” (http://earthsky.org/earth/sunni-robertson-on-how-a-kingfisher-inspired-a-bullet-train), June 21, accessed November 17, 2014. 50. Altshuller, G. 1996. And Suddenly the Inventor Appeared: TRIZ, the Theory of Inventive Problem Solving, Translated by Lev Shulyak from the original 1984 Russian version, Technical Innovation Center, Inc., Worcester, MA. 51. Nierenberg, G.I. 1982. The Art of Creative Thinking, Barnes & Noble Books, New York, NY. 52. Tice, L. 2011. “Magic Words,” Winner’s Circle Network with Lou Tice, e-newsletter, July 18. 53. Walesh, S. G. 2000. Street Storage System for Control of Combined Sewer Surcharge, EPA/600R-00/065. U. S. Environmental Protection Agency, Washington, DC. 54. McCullough, D. 1977. The Path Between the Seas: The Creation of the Panama Canal 1870-1914, Simon & Schuster Paperbacks, New York, NY. 55. Von Oech, R. 1990. A Whack on the Side of the Head: How You Can Be More Creative, U. S. Games Systems, Inc., Stamford, CT.
56. Cozolino, L. 2013. “Nine Things Educators Need to Know About the Brain,” Greater Good: The Science of Meaningful Life, (link), March 19, accessed March 30, 2016. (Article is excerpted from the writer’s book The Social Neuroscience of Education: Optimizing Attachment and Learning in the Classroom, W. W. Norton & Company, New York, NY, 2013. 57. Willis, J. 2012. 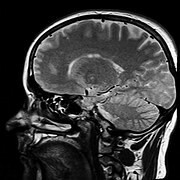 “A Neurologist Makes the Case for Teaching Teachers About the Brain,” edutopia, (http://www.edutopia.org/blog/neuroscience-higher-ed-judy-willis), July 27, accessed April 3, 2016. 58. Baer, D. 2014. “Here’s Why Writing Things Out by Hand Makes You Smarter,” Business Insider Australia, December 17. 59. Buzan, T. 1983. Use Both Sides of Your Brain, E. P. Dutton, New York, NY. Personality profiles are one factor to consider in forming teams in the spirit of the Medici Effect. If you have never had your profile analyzed, you may be interested in doing so and this exercise provides the opportunity. If you have already been profiled, doing it again would be useful if for no other reason than to see if it changes. 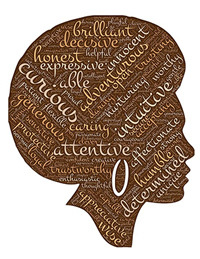 Personality profiles – ours and others – help us understand and deal with our feelings and needs and those of the people we study and work with and serve. The results of this exercise should be confidential, unless you want to share them with your instructor or other trusted persons. Arrange for a personality profile assessment possibly using one of several personality profiling systems. As a student, you might get help from your campus career office or the health center. Study the results, recognizing that there are no “right” or “wrong” profiles. They are, as already noted, what they are. Analyze your profile relative to your desired success and significance. What are your strengths and weaknesses or assets and liabilities and what might you do about them? Also recall and learn from recent positive and negative interactions with students, faculty, co-workers, supervisors, and others in light of the added personal insight. Try to see how you and they might connect or disconnect based on your known profile and what you may be able to deduce about theirs. Going forward, maybe you can be more empathetic and proactive and develop or strengthen some of your relationships. 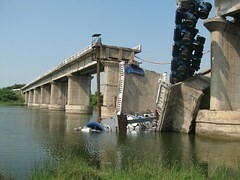 A major bridge just failed, with loss of life and great disruption of river navigation and motor vehicle traffic. As an alternative, imagine the catastrophic failure of some other major structure, facility, system, or process; briefly describe or illustrate it; and proceed with the exercise. Your engineering firm has been retained to analyze the failure and determine its cause or causes. Your interdisciplinary team (e.g., engineers, environmentalists, surveyors, divers, etc.) just made an initial one-hour visit to the site to view the failure. Before proceeding with on-site investigations and then determination of possible causes, your team decides to meet and plan its approach. At the meeting, the group constructs a fishbone diagram. In applying Fishbone Diagramming, you try to imagine all the possible causes of failure. After completing the diagram, you intend to use it to develop your project plan, that is, who will do what and when and how will they do it. However, for the time being, you are concentrating on the diagram. Summarize your results in the form of one fishbone diagram. 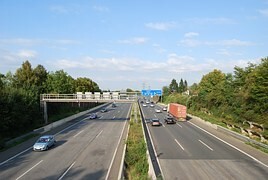 Concrete and steel barriers are routinely used between opposing lanes of high speed highways. They serve the single purpose of greatly reducing the likelihood of head on collisions. Imagine that your team is in the very early stages of planning and designing a high - speed highway system for a developing country. Median barriers are necessary. However, perhaps the barriers, or more precisely, a barrier system, could provide the opportunity to cost-effectively serve multiple purposes. Maybe the barrier system could fulfill many infrastructure and other functions. Use Mind Mapping to identify possible multiple uses of the barriers. Concentrate on developing many ideas – go for quantity, not quality. Summarize your results with a list of the ideas you generated. A former champion high diver, who is now a college diving coach, encourages members of the diving team to experiment with ever more complicated dives. However, as the dives get more complex, the frequency of hard collisions with the water and possible injuries increases. The coach is torn between enhancing the difficulty of the dives versus protecting the divers (adapted from Altshuller50). What do you suggest? 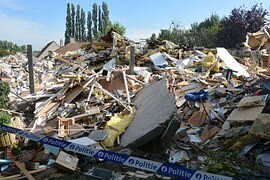 Think of the types and huge amounts of waste and debris resulting from natural and other disasters. What if? all the waste and debris was magically sorted, then we could …..
What if? all the waste were organic, then we could…. Don’t “get in the weeds.” Just use What If? to generate as many ideas as you can. At this stage, go for quantity, not quality and do not be concerned about practicality. Summarize your initial ideas in the form of a list. Dear Reader: If you got this far, in the spirit of improvement of this work-in-progress, please share questions, suggestions, concerns, sources, etc. that you may have with me at: stuwalesh@comcast.net or 219-242-1704. I welcome opportunities to collaborate, write, speak, conduct workshops, and consult.